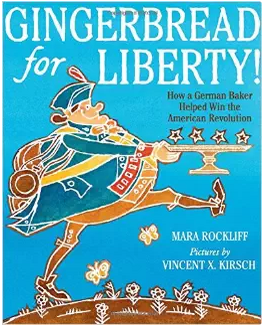 Gingerbread for Liberty! : How a German Baker Helped Win the American Revolution by Mara Rockliff and illustrated by Vincent X. Kirsch is a fabulous picture book that tells the story of a German baker's experience during the years that led up to the Revolutionary War. While it teaches about the war through a different perspective, it could inspire students to ask questions about different cultures in early America. Because Christopher Ludwick was a real person, some students may also be inspired to research more about him, as he was a generous beneficiary to many people who couldn't afford an education, in addition to a being a great baker. 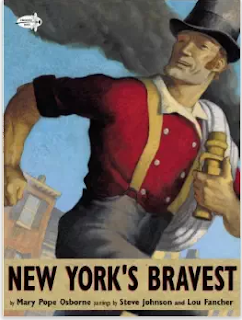 New York's Bravest by Mary Pope Osbourne and Steve Johnson reads like a legend, as it tells the story of Mose Humphreys, a New York firefighter in the nineteenth century. Dedicated to the firefighters who died in the World Trade Center attack, this book is a wonderful example of text written to celebrate someone. It would also lead to great discussions about what is real and what is exaggerated and what is realistic fiction and how exaggerations move it into the realm of legend. I was in the library this afternoon looking for some books that would inspire students during our summer writing academy when I got distracted by the Woodson books on the shelves. 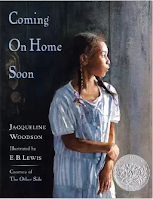 I love Brown Girl Dreaming, and Each Kindness, but I had never read some of Jacqueline Woodson's other books. I sat down and read one of them right on the spot. 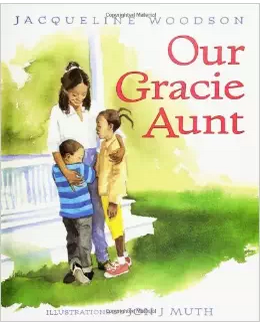 Honestly, Our Gracie Aunt took my breath away. I knew that Jacqueline Woodson writes emotional books, but I wasn't ready for the power of this picture book. I found myself welling up right there on the library floor. This is a book that I would use to teach turning points to young readers and writers, as the emotional arc in the story is intense. I brought some of Jacqueline Woodson's other books home with me, so that I could cry in a less public setting. Mama's hands are warm and soft. When she put her Sunday dress into the satchel, I held my breath. Tried hard not to cry. I would love to talk to students about how that last sentence is so powerful, not only for the meaning, but also because of the use of a fragment. E.B. Lewis illustrated this book, and did an amazing job at capturing the story and suggesting what might be happening with the artwork. I could envision powerful conversations emerging from the secondary storyline that exists in the illustrations. If you are trying to teach students how to capture dialogue and details of a place, We Had a Picnic This Sunday Past has fabulous examples and mentor passages. I loved the line "Grandma says Martha should be in any room but the kitchen." What an amazing job of holding on to the funny things people say and then re-creating them in a book Jacqueline Woodson does. 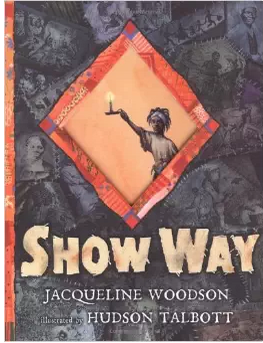 And then Show Way is a book that I will return to again and again. I'm planning to sit down with a pile of post-its and mark it up for the power of images--, the power of listing things in a series--stars and moons and roads--, the power of repetition--Loved that baby up so. Yes, she loved that baby up...If you have never read Show Way, I highly recommend it for both the incredible prose and the beautiful artwork by Hudson Talbott. Just have tissues close by. Each summer, we offer a Summer Writing Academy for students who love to write. We organize and plan the academy with specific themes in mind, and this year, we are planning to emphasize the power of story in relaying opinions and messages. 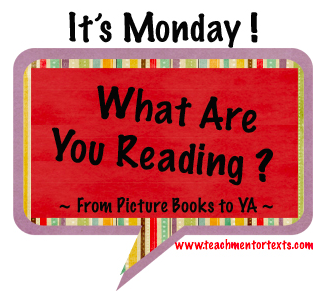 Additionally, we will study mentor texts that celebrate people and places, and I am predicting that many of our students will write some wonderful pieces along the lines of When I Was Young in the Mountains by Cynthia Rylant, one of my all time books and one that celebrates the magic of a place. Today, I spent some time in the library looking for and rereading books that contain opinions, as well as books that celebrate people or places. I'm guessing that most of you have read Each Kindness by Jacqueline Woodson, but it was wonderful to read it and think about it as a book with a strong opinion that so many children share. We should all treat each other with kindness is a popular claim for elementary opinion writing, but Each Kindness is a beautiful example of how narrative writing can express that claim. Along similar lines is Roller Coaster by Marla Frazee. 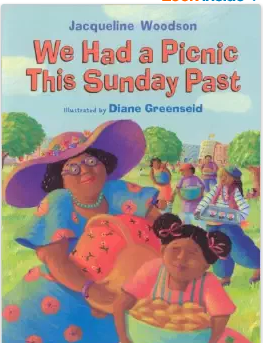 We usually use this book as a mentor text for teaching students about the power of small moment stories, but this book also has an opinion about trying new things that is embedded within the story. I forgot about The Wednesday Surprise by Eve Bunting as a book we could since it is such a beautiful narrative about never being too old to learn something new. Dr. Seuss is an author who embeds strong opinions, and his work will definitely find a place in our Summer Academy. If you have some other favorites or suggestions, please share!